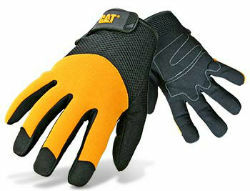 Synthetic palm, padded in high wear areas for increased protection. Yellow Spandex® back for superb fit and comfort with mesh upper for added ventilation in high temperatures. Adjustable wrist strap for a secure fit. CAT® logo rubber patch on cuff of each hand.